Yep – this is easily the weirdest transfer of the month! The 31-year-old, formerly of Portsmouth and Spurs, among 12 other clubs, will arrive to compete with Barcelona’s plethora of midfielders for game-time. Manager Ernesto Valverde has stopped selecting former Liverpool star Coutinho in his three-man midfield, rotating him in and out of the front-three instead – so this signing is another nail in the coffin of his central opportunities. Coutinho is already behind the likes of Arturo Vidal, Ivan Rakitic, Arthur and Carlos Alena in contention for the two spots alongside Sergio Busquets – and now probably KPB as well! Fans of all clubs on Twitter found the transfer ridiculous, with one suggesting that Barca are ‘trolling’ Coutinho at this point! It doesn’t look good for the Brazilian, does it? 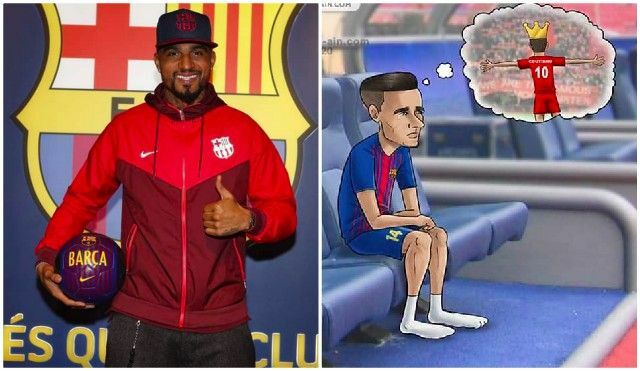 Imagine going from being the main man at Liverpool, faking a injury after interest from Barcelona before the deal finally being concluded to being potentially replaced in the squad by Kevin-Prince Boateng. "Lets sell Coutinho and loan Boateng"
Sell Coutinho to buy KP Boateng. Who is in charge of Barca transfers lately ?